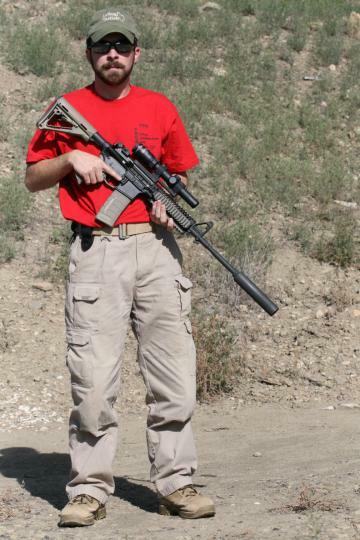 Tim Pack is a Cowboy Action, IDPA and 3-Gun shooter from North Carolina. Long range rifle targets, fantastic stages, and some of the prettiest country you're ever going to see. 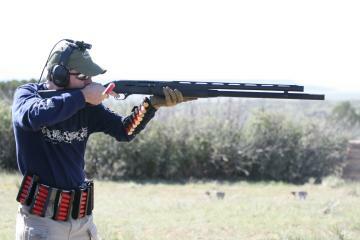 That pretty much sums up my first experience at the 2008 Rocky Mountain 3-Gun nationals. Held at the awe inspiring NRA Whittington Center in Raton, NM, the Rocky Mountain 3-Gun nationals sets the standard for other 3-Gun competitions to strive for. This being my first major 3-Gun match, I wasn't exactly sure what to expect, but I went in to it with an open mind and high personal expectations. Arriving at the Whittington Center a day prior to the match, Zak Smith and I decided to scout the stages. It wasn't until we started walking the stages and ranging targets, that I realized this was nothing like the CQB run-n-gun 3-Gun matches of the east coast. Rifle targets out to 575 yards, 100 yard shotgun targets, 50 yard pistol targets, and lots of movement on each stage. Keep in mind that all of these stages were being run at 7000ft above sea level. This match was like none I had ever been to before. The way the match directors, JJ and Denise, designed and laid out the stages was nothing short of phenomenal. Utilizing the vast and rugged terrain of the Whittington center, each stage had its own personality and design style. Ranging from simple stages requiring only one weapon, to stages with over 100 yards of required movement and all three weapons, this match was the epitome of a "Big Boy" match. The complexity and difficulty of the stages quickly put me in my place, and exposed my weakness. 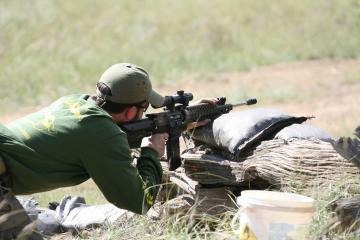 Tim had a hard learning curve at his first major 3-Gun match. Due to a strong background in shotgun shooting, he did well on Stage 2.
me to get a handle on and also the thing that hurt me the most on the scoreboard. Breaking down each stage and going through the stage over and over again until you are absolutely sure on how to shoot it is essential for a successful run. Too often I found myself pausing during the stage to think about what I was supposed to be shooting, instead of actually shooting the targets. That is not to say that I don't know how to plan out a stage, but rather until you have seen stages like this, it is hard to wrap your head around firing more than 100rds per stage. You have to have your head in it or you will not perform to the best of your ability. Dare I say, at a match like this, your mental game is just as important as your shooting ability. The 400+ yard rifle shots at RM3G are a shocker to shooters who don't shoot these distances in local, regular matches. just completed a week long training course, and not a 3 day competition. This is not your monthly 3 gun match, not even close. This match definitely pushed my physical and mental limits further than they had ever been pushed and I am a better shooter because of it. Learning from your mistakes is one of the great hallmarks of any successful craftsman, whether it be shooting, teaching, or competing. I learned many things from this match, but most importantly, is that I have to have my head in the game, and keep it there throughout the entire match, or I will be in for a repeat of 2008. All in all, this is the best 3-gun match I have ever competed in, and I look forward to shooting the '09 match. If you are looking for the best 3-gun match in the country, then you owe it to yourself to shoot the Rocky Mountain 3-Gun.